Girlguiding Lincolnshire South is proud of its strong connections with Guiding in Belarus. Our link helped to support the development of the Guiding programme in the country after the break-up of the Soviet Union. It continues to grow year by year. Click the links below to try activities to help celebrate the anniversary with your Unit, or read on to find out more about the link itself. 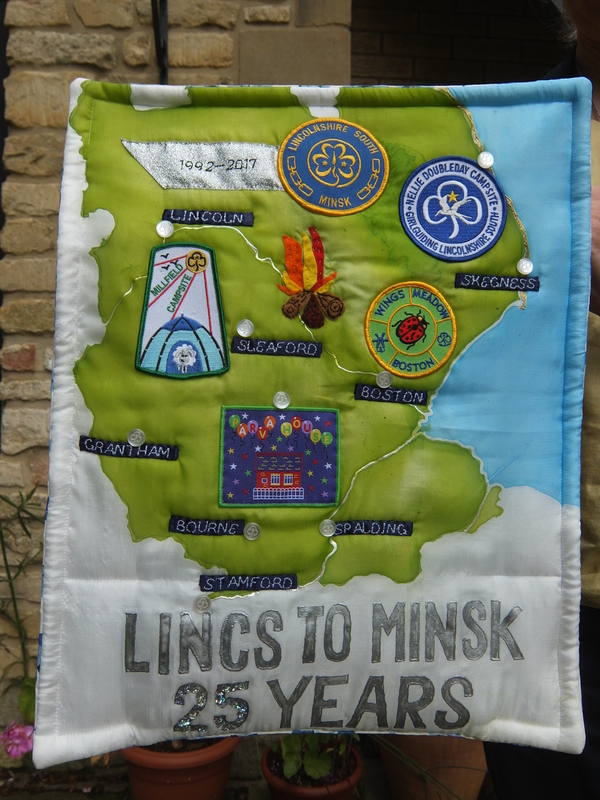 Our link with Guiding in Minsk was established in 1992 when Lincolnshire South Guide Association hosted a small group from Minsk, Belarus at ‘Poacher’, Lincolnshire’s International Guide and Scout Camp. This group was searching for a worthwhile Youth Association to replace the collapsed Pioneer Movement and had come to find out about Scouting and Guiding. The group camped with Long Sutton Guides and experienced something of the fun and friendship that the Movement has to offer at Poacher ’92. 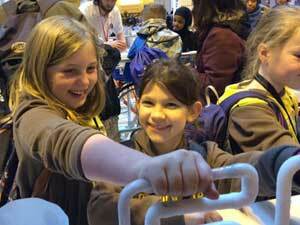 Their first taste of life at a Guide and Scout Camp was followed by a few days in home hospitality in Dunston. On departure, Ludmila Zybina, their leader asked Phyll Sands if she would promise to take a party out to Minsk the following year. Phyll did so and sure enough the following April an official invitation arrived. 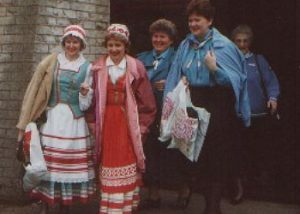 So, in 1993 a County group of Guides visited Minsk for two weeks. They stayed in Gomel with children recovering from the Chernobyl disaster, and also in homes in Minsk. Most years between 1994 and 2007 visits were made alternately from the two countries by groups of Guides and Senior Section. Visits to Lincolnshire included trips to the seaside, a novelty for those living in a landlocked country, exploration of places of cultural interest and participation in adventurous activities. These were particularly popular as there was little opportunity to try them in Belarus. According to the girls visiting here in 1998 it was a ‘dream come true’ with new friendships developing and guiding skills, crafts and ideas to take back and teach others in Minsk. Our visits to Belarus included reciprocal visits to places of cultural interest and the opportunity to be welcomed to a country and lifestyle rather different to our own. In 1998 the Association of Belarusian Guides gained Associate membership of the World Association of Girl Guides and Girl Scouts. This was swiftly followed by Full Membership in 2002. In 2002, the 10th Anniversary year of our link, thirteen girls and three leaders visited Minsk in late July/August followed in the September by a visit from four Minsk leaders to share our celebrations. This included a visit by the Belarusian Ambassador to the UK. In 2003 eleven of our Senior Section members and four Guiders from Lincolnshire South attended the first Belarus International Camp held in Gomel. They participated in the ten day camp and stayed with families in home hospitality in Minsk for three days. 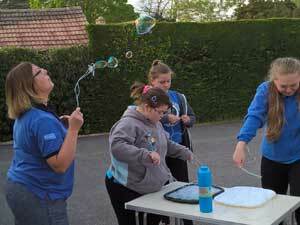 Since then, alternate visits have continued and have incorporated elements of Girlguiding UK’s Senior Section programme, in particular ‘In4mers’, the peer education project. In the summer of 2009 we were expecting to welcome a group of young guiders and two leaders to our Training and Activity Centre at Trusthorpe. This would have been followed by hospitality in the homes of our young people for a few days before overnighting in a youth hostel in London prior to their flight home. Sadly, less than two months before their arrival, the visit had to be postponed due to the difficulties and complications the Minsk group were experiencing obtaining their visas. 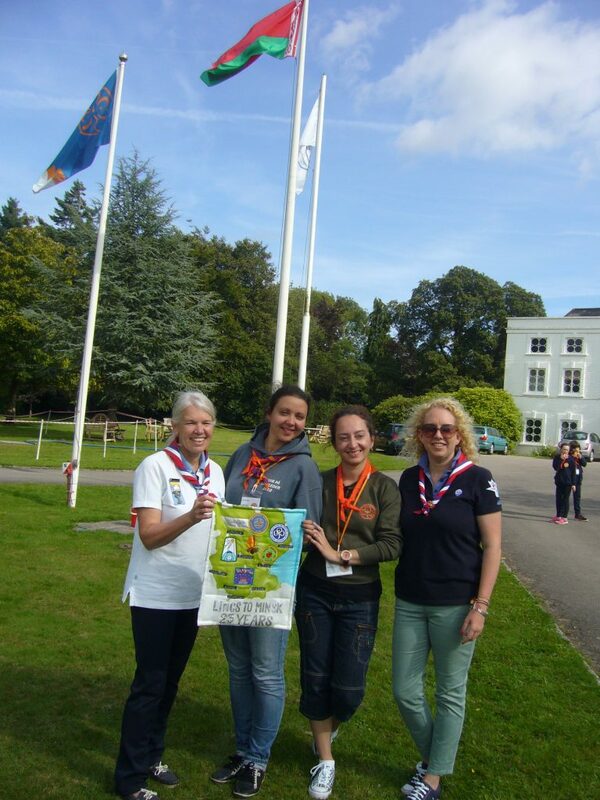 However, a group of 3 leaders from Minsk attended the County Centenary event at PGL in July 2010, and the Link continued in 2011 when a party of 3 leaders and 8 girls experienced a visit to Belarus to take part in a joint camp with girls and leaders from Minsk. The eagerly anticipated trip saw them staying at Galaktica for eight days, enjoying varied and very different activities together. On leaving the camp the group then had the opportunity of home hospitality with families in Minsk for the remainder of the stay and the days were packed with cultural and interesting sightseeing, either together as a group or individually with the families. Once again, as with all exchange visits, true friendships were made and shared experiences will remain in the memory long into the future. To celebrate the 20th Anniversary of the Link in 2012, a party of 14 girls and 2 leaders came over to Lincolnshire South in July. The group went firstly to Trusthorpe to camp with Guides and Senior Section girls from all over the County, then on to a four day stay at Parva House for cultural visits and relaxation time before travelling back to Minsk. Whilst here, a Celebration afternoon was held at Mablethorpe for all those involved in the Link over the past 20 years. 2013 was a Poacher year again, so no visit was planned but a Skype link from Poacher to Minsk was made, reuniting some old friends and marking the start of some new friendships. This was also the year that we learned of the death of Ludmilla Zybina and she will be greatly missed. In 2014, 6 girls and 2 leaders from Lincs South took part in the camp at Galaktica followed by home hospitality in Minsk. This was the first group to actually camp there as tents were pitched on wooden platforms and contained thick mattresses to sleep on. The following year, the visit from Minsk was again postponed. Economic hardship in Belarus had led to a fall in membership, with corresponding financial problems for the Association of Belarusian Guides. The leadership there felt they must concentrate on recruitment and training and we offered our support. We were so pleased to host another group in 2016. They stayed at camp in Trusthorpe followed by four days in home hospitality and an overnight stay in London. 2017 marked the 25th Anniversary of our link. A fundraiser badge was created in County and linked to trying out some Belarussian activities. A group from Belarus visited Hampshire North’s County Camp and the Minsk Co-ordinator and County International Adviser travelled down to Foxlease to visit them and present a commemorative wall hanging to take back to Minsk. The following year, nine girls and two leaders from Lincs South visited Belarus, where they spent a week in camp and three nights in home hospitality. Unfortunately, in 2019, no English speaking leaders were available to bring a group on a return visit to Lincolnshire for our County Camp at Walesby Forest. 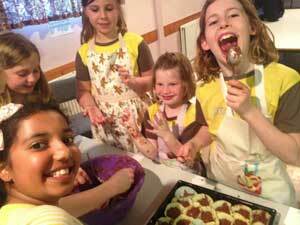 Girlguiding Lincolnshire South supports the visits of our Belarusian friends with fundraising throughout the county. Without these generous donations, and past support from Connect Youth International/British Council, the link could not have been progressed and would not exist in the format it does today. We are all committed to many further years of mutual friendship and support so watch this page for further news! Most years there are opportunities for Lincolnshire South Guides / Senior Section members to take an active part in our Link with Minsk Guides, either participating in a visit to Belarus, or forming part of the Lincolnshire South team who live and work with Minsk Guides when they visit Lincolnshire, and maybe also offer home hospitality to our visitors. If such an opportunity might interest you, please contact our County International Adviser. How can you celebrate the Minsk / Lincs Link in your Units? Girlguiding Lincolnshire South has produced an Activity Pack suitable for all sections which is full of fun activities (crafts, games, recipes etc) for you to try in your unit and experience a taste of the culture of Belarus. If you would like a Pack, contact us using the link below or try the activities on the links above and help with fundraising by buying a badge. There is also a ‘Belarus Box’ which can be borrowed to use with your unit. It contains artefacts from the country and suggested activities to try.